Almost 6,000 runners took part in the 13th edition of Al Dana Green Run hosted by Doha Bank, one of the largest private commercial banks in Qatar, on Saturday, 9 December, at Aspire Zone, Doha. Organized in partnership with Aspire Logistics, Ministry of Youth and Sports (Qatar Sports Federation for All), Ministry of the Interior, Olympic Committee (Qatar Athletics Federation) and Qatar Red Crescent the annual with the aim of promoting environmental awareness, and social and sports activities across the country. The event, which derives its name from Doha Bank’s flagship Al Dana Saving’s scheme, has been known as the most popular CSR event in Qatar and this year’s edition was even more special as it coincided with the commencement of Qatar National Day celebrations for 2017 and it also witnessed one new Doha Bank customer, Mr. Abdul baheer Nadathara Moldutty, being crowned as the new millionaire for Al Dana Saving’s Scheme 9th draw of the year. Other lucky winners for this month’s draw included 15 winners for QAR 10,000, 1 winner for QAR 100,000 and one more who walked away with the QAR 25,000 prize. Thousands of runners, families and members of Doha’s community gathered at Aspire Zone on Saturday morning to support the event and the cause, paying homage to Qatar, its government and people while enjoying a perfect fun-filled event. Chief guests included H.E. Salah Bin Ghanim AL-Ali, Minister of Culture & Sports, H.E. Hassan Al Thawadi, Secretary General Supreme Committee for Delivery & Legacy and Guests of Honor Dr. Mohamad Al-Kuwari -Consultant & Metabolic Surgeon at HMC & President of Qatar cycling and triathlon federation, Dr. Jassim Fakhro -Consultant bariatric Metabolic & Robotic Surgeon at HMC and Dr. Abdullaziz AL-Kuwari, MD, MSC Consultant Spine Surgeon –Orthopedic Surgery. “We are thrilled to celebrate another wonderful and unique edition of Al Dana Green Run as part of Doha Bank’s ongoing campaign that aims to build environmental awareness among the local community. To witness the support of Doha’s residents, our loyal customers and Qatar as a nation, is simply heartening. 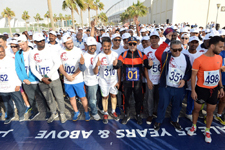 The remarkable success of the run gives us extra motivation to take our mission of spreading the positive messages of environment conservation and green living to the next level while sharing the love and respect we have for Qatar and its Emir,” Dr. R. Seetharaman, CEO of Doha Bank Group said. The Al Dana Green Run’s registered entrants competed in 10 individual categories covering various age groups and skill levels, such as professional runners, individual below 18, families and participants with special needs to name a few. The winners of each category walked away with unique prizes handled out during a joyous and colourful awards ceremony featuring live concerts and entertainment. Among the many who joined the event this year there were more than 100 Doha Bank’s staff and many families, runners and supporters including Miss Nisma Kamran, “Al Dana Green Run is one of our favourite community events in Qatar. It represents the perfect fun-family day which promotes at the same time important concepts such as green and healthy living,” she said. As in the past, around 109 special needs runners representing various local special needs associations took part in this year’s run as well. "We are here to support Al Dana Green Run once again as we thoroughly believe in the positive impact this unique event has on our members. We would like to thank Doha Bank for offering such a great opportunity to connect with the local community and letting our runners challenge themselves and excel in their running category. We couldn’t be any prouder” said Mr. Ahmed Saker Al Hamzi the spokesperson of Qatar Society For Rehabilitation of Special Needs. Members of the crowd and audience, who attended to cheer on their relatives, enjoyed free entertainment, which included a dedicated fun zone area full of kids’ activities, such as face painting, inflatables bouncy castles, giant slides, football and basketball competitions, as well as coloring crafts workshops to name a few. In addition, the runners and the crowd were provided with complimentary refreshments courtesy of Ezdan, Krispy Kream and Chipstix Doha.